So…2013 is kind of nuts. So far, it’s all about the work, with the occasional summer frolic and wedding (not mine) squeezed in. One of the downsides of the busy is that some of the small good things I do can fall away in the mad rush. Late last year as I careened towards holidays, I noticed that I was forgetting to take my reusable bags to the shops, I was churning through disposable coffee cups, and I even grabbed coffee from cafes without checking their fair trade status. Eek! Dropping the ball on these things from time to time is human. An off day or week here and there isn’t going to affect the quantum of my good efforts over a lifetime. But an off day or week can often be the beginning of a broken good habit. Good habits maintained over a lifetime will dramatically affect the quantum of my good efforts and also makes those small things an effortless part of my day. So I’ve written myself a list to put on the back of my door (my apartment is so tiny I will be able to read this list from almost every corner). This list isn’t wildly aspirational – just the small good things I can do without much effort every day. Envirosax are my favourite because they fit heaps of shopping and are easy to fold back up. I have a Keep Cup because they fit in coffee machines. It’s too easy to throw something in the rubbish when the recycling is piling up. If I think about my morning in advance I can be sure I will have time to go to my favourite fair trade place rather than grab whatever is nearest and most convenient. This is a double-whammy – I avoid the packaging of a bought lunch and the temptation to buy the cheapest thing available (which is probably also the least environmentally-friendly). I’ll admit this is probably the hardest item on the list but much easier if it’s a part of my regular routine. Good for the environment, body, mind and soul. If I tell myself I don’t have time to walk it’s a sign I should recalibrate my day immediately. Buying bottled water when it comes free and clean out of the tap is, to my mind, both appalling and stupid. And yet, still tempting if I find myself out and about without water. My suburb has an amazing collection of buskers. Having a live soundtrack for my shopping is one of the great daily joys in my life. I like to support the brave souls who bring music to the street and to express my appreciation with a few coins. My little balcony garden won’t feed a family any time soon, but it does keep me well stocked of fresh herbs and less reliant on the shops to make my dinner taste good. Believe it or not, I can easily forget to water it for an entire week. 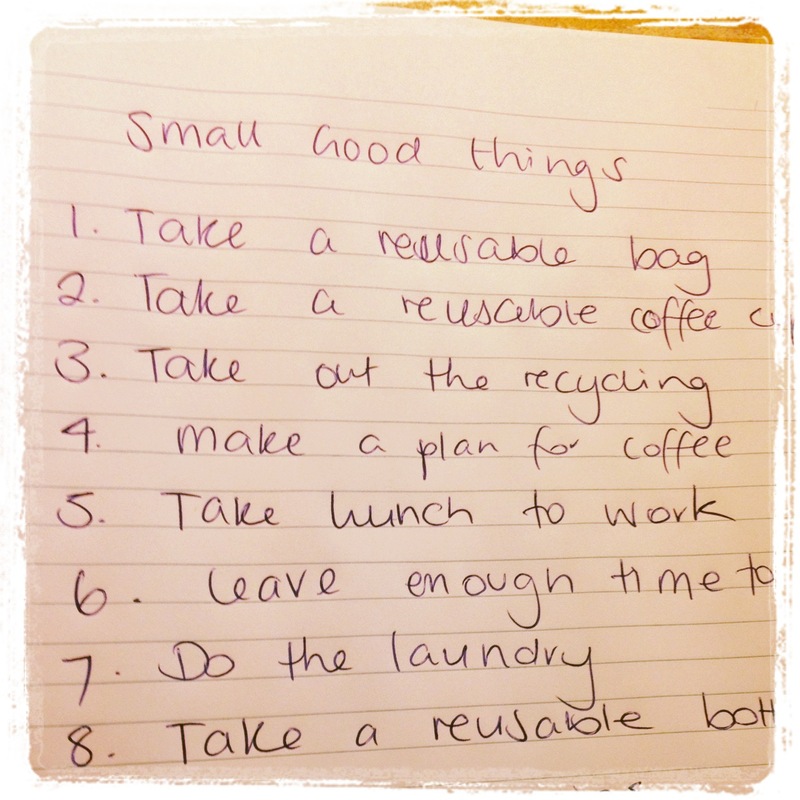 So, what small good things are part of your daily routine? This entry was posted in Culture, Featured and tagged 99 tips for a better world. Bookmark the permalink.